StageBuzz.com: Red Shirt Entertainment Announces New Concert Piece - "The Little Rock Nine Project"
Red Shirt Entertainment Announces New Concert Piece - "The Little Rock Nine Project"
Red Shirt Entertainment, in association with Camp AmeriKids, Be.Do.Fly! 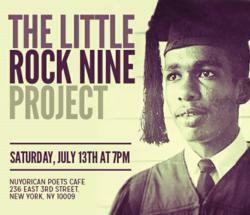 and the Nuyorican Poets Cafe, is announcing a new concert piece entitled “The Little Rock Nine Project.” The event will take place on Saturday, July 13th at 7:00PM at the historic Nuyorican Poets Cafe, located at 236 East 3rd Street in New York’s East Village. The project will honor the legacy of the Little Rock Nine, the Civil Rights group that challenged racial segregation at Little Rock Central High School in 1957, through original monologues, poetry, letters and music. In attendance will be Little Rock Nine member, as well as Congressional Gold Medal and NAACP Spingarn Medal recipient, Ernest Green. "It's an incredible honor to have a Civil Rights icon and dear friend, Ernest Green, attend our event and to have several politically-conscious organizations come together for this common goal,” said Red Shirt Entertainment Artistic Producing Director and Be.Do.Fly! Founder Rajendra Ramoon Maharaj. Parties involved in the conception of the project include Maharaj and participants of the Camp AmeriKids Leader-in-Training (LIT) Program. AmeriKids is a non-profit group devoted to enhancing the lives of young people coping with the challenges of HIV/AIDS and sickle cell disease. LITs range between the ages of 16 and 18. The performances are meant to parallel the struggles in their lives with those of the Little Rock Nine. All proceeds from the night will go toward AmeriKids, in addition to Be.Do.Fly! and the Nuyorican Poets Cafe – both non-profit organizations, as well. Please reserve tickets and make your $20 donation by visiting www.redshirtentertainment.com.